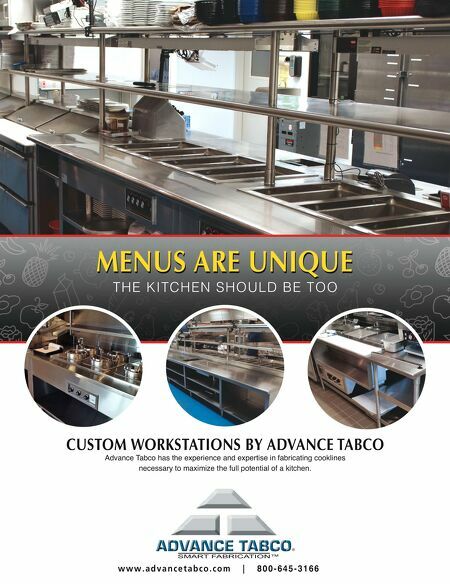 42 • FOODSERVICE EQUIPMENT & SUPPLIES • SEPTEMBER 2018 That one microwave led to 50 pieces of replacement equipment across 34 locations. Harrison's now working with that same chain to fully equip store remodels and open new locations. "I'm getting all that equipment because I walked into the situation, rather than ran into it full-steam," he says. Harrison's start-small-and-earn- their-trust method shows success in his sales record at Supplies on the Fly over the last few years. In 2015, his sales totaled $6.8 million. In 2016, his sales reached $8.1 million. In 2017, he hit the $12.1 million mark, and this year Harrison is on track to hit $14 million in sales. That's an aver- age increase of about $2.4 million per year, with the highest increase being $4 million. Heavy equipment accounts for 62 percent of his sales, followed by smallwares/tabletop (21 percent), light equipment (11 percent), furniture (4 percent), and janitorial (2 percent). Harrison has been with Supplies on the Fly for 12 years and developed many long-term customers during that time. 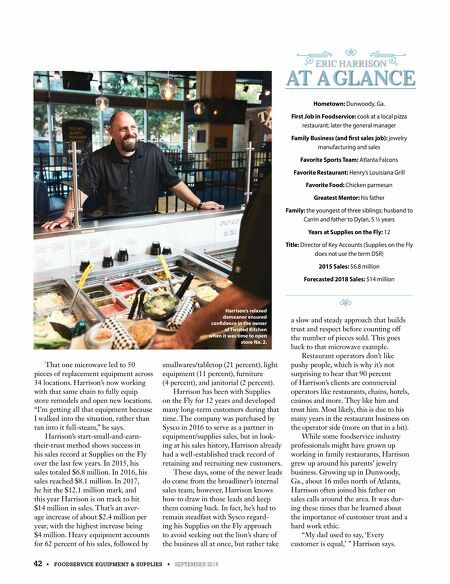 The company was purchased by Sysco in 2016 to serve as a partner in equipment/supplies sales, but in look- ing at his sales history, Harrison already had a well-established track record of retaining and recruiting new customers. These days, some of the newer leads do come from the broadliner's internal sales team; however, Harrison knows how to draw in those leads and keep them coming back. In fact, he's had to remain steadfast with Sysco regard- ing his Supplies on the Fly approach to avoid seeking out the lion's share of the business all at once, but rather take a slow and steady approach that builds trust and respect before counting off the number of pieces sold. This goes back to that microwave example. Restaurant operators don't like pushy people, which is why it's not surprising to hear that 90 percent of Harrison's clients are commercial operators like restaurants, chains, hotels, casinos and more. They like him and trust him. Most likely, this is due to his many years in the restaurant business on the operator side (more on that in a bit). While some foodservice industry professionals might have grown up working in family restaurants, Harrison grew up around his parents' jewelry business. Growing up in Dunwoody, Ga., about 16 miles north of Atlanta, Harrison often joined his father on sales calls around the area. It was dur- ing these times that he learned about the importance of customer trust and a hard work ethic. "My dad used to say, 'Every customer is equal,' " Harrison says. Hometown: Dunwoody, Ga. First Job in Foodservice: cook at a local pizza restaurant; later the general manager Family Business (and first sales job): jewelry manufacturing and sales Favorite Sports Team: Atlanta Falcons Favorite Restaurant: Henry's Louisiana Grill Favorite Food: Chicken parmesan Greatest Mentor: his father Family: the youngest of three siblings; husband to Carrin and father to Dylan, 5 ½ years Years at Supplies on the Fly: 12 Title: Director of Key Accounts (Supplies on the Fly does not use the term DSR) 2015 Sales: $6.8 million Forecasted 2018 Sales: $14 million AT A GLANCE AT A GLANCE ERIC HARRISON E 7 E 7 Harrison's relaxed demeanor ensured confidence in the owner of Twisted Kitchen when it was time to open store No. 2.